Eight-piece brass sensation, The Soul Rebels, is riding high after last year’s debut on The Late Show with Stephen Colbert, touring four continents (Europe and Australia and debuting in China and Japan), and collaborating live with Nas, G-Eazy, Robert Glasper, DMX, Macklemore & Ryan Lewis, and Marilyn Manson and opening for Lauryn Hill. The Soul Rebels started with the idea to expand upon the New Orleans brass tradition they grew up on and the pop music they loved on the radio. They took that tradition and blended funk and soul with elements of hip-hop, jazz and rock, and placed them all within a brass band context. The band has built a career around an eclectic live show that harnesses the power of horns and drums in a deep-pocket funk, party-like atmosphere. When not touring, The Soul Rebels have a weekly show at New Orleans’ Le Bon Temps Roulé that’s known to erupt with the kind of contagious, shout-along musical mayhem that the Rebels bring with them wherever they perform. 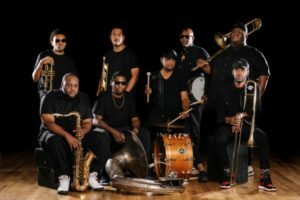 The Soul Rebels continue to chart new territory as they are featured in major films, tour globally, and combine topnotch musicianship with songs that celebrate dancing, life, funk and soul.